The new images of this handset show a metal unibody design with a fingerprint reader on the back. The leak also comes with a few details - a MediaTek Helio P15 processor, 4 GB RAM, 32 GB internal storage, and a 5.5-inch full HD display are all expected to be in the features list. Lenovo Moto M has been in the rumor mill since August, and now it seems like its launch is imminent. The latest leaked images show what resembles a product ready to hit the market. More than just images, we also get information regarding the essential specs and features. 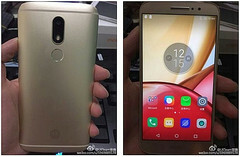 According to NowhereElseFr editor Steve Hemmerstoffer, Lenovo Moto M is a handset with a 5.5-inch full HD display that uses a MediaTek Helio P15 SoC, next to 4 GB RAM and 32 GB internal storage. This device comes with an 8 MP front shooter and a 13 MP main camera, being powered by a 3,050 mAh battery. Unfortunately, it seems it will not run Android 7.0 Nougat out of the box since the unit shown by Steve's images runs Android 6.0 Marshmallow. This phone will probably hit the market as a premium mid-ranger later this month. There is no detailed information on its launch date or pricing yet, but we might find out more soon, so stay tuned.